For a long time I have been wanting to show everyone my hiking cook set up. 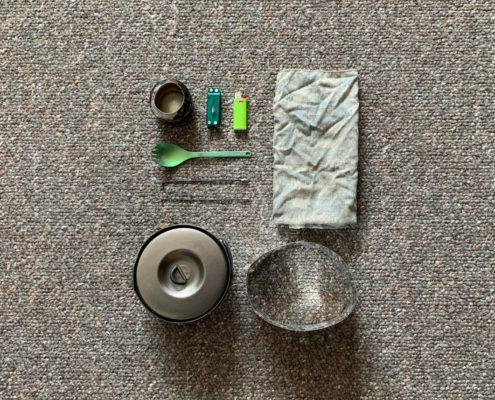 My currently hiking cook set up is the result of fine tuning over many years. Even as I write this I’m considering something new, but I’ll save that for another time. A lot of people ask what I cook on and are shocked at the small size of my set up. 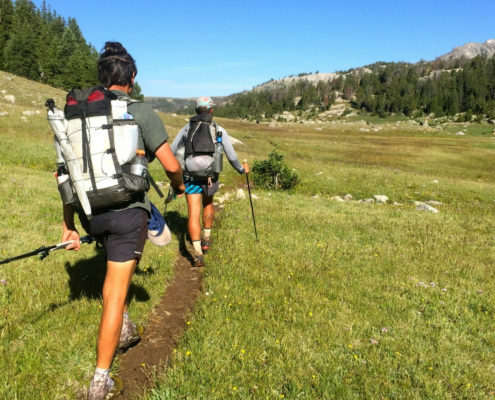 They see it as extreme but in reality it’s quite common among thru-hikers and other long distance adventurers. Today there’s a growing trend of stoveless hikers. Personally, after long day of hiking I want a warm meal. It just feels good. My hiking cook set up is basically aluminum flashing with holes punched on the bottom for air flow, then four more holes near the top for two stakes to slide through. These stakes make a resting spot for my pot which is just above my alcohol stove, ensuring an equal flame coverage. The windscreen protects from the wind and acts as a pot stand at the same time. My stove, lighter and bandana all fit inside my pot. While the two stakes and titanium spork go in the stuff sack. Lastly, I wrap the flashing around the pot itself. All in all it’s quite compact. 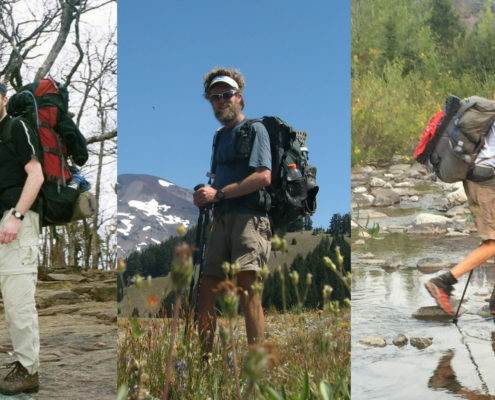 You can see how my hiking cut set up and the rest of my gear choices changed over time on my Hiking Gear page. 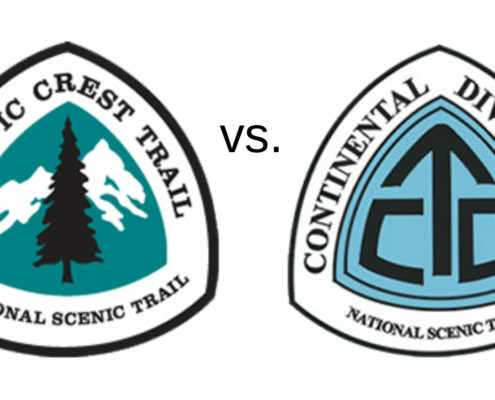 I started hiking with a a 1.2 liter pot and the MSR Whisperlite International, which is one of the most versatile stoves ever made. At the time it was fine for my beginner hiking style. With its ability to burn multiple fuels, easy set up and serviceability it was a great stove for a first time hiker/backpacker. When taken as a whole, stove and fuel bottle, priming, and care, this system was not a compact and simple enough for my advancing skills. 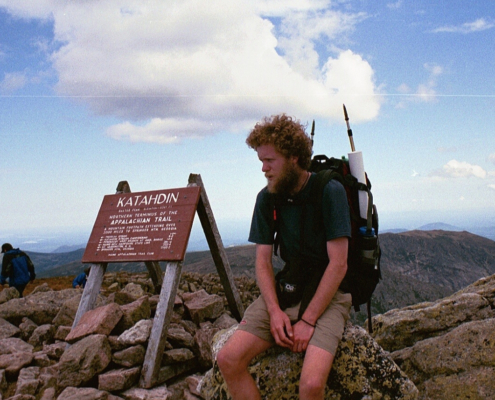 By the time I got to the Appalachian Trail my hiking and technology had advance. I move to a MSR Superfly. It was smaller, lighter, more compact, and took less time to operate. The Superfly was great but personally found some drawbacks (stability and it was susceptible to wind). My hiking continued to progress and as it did, I wanted more from my hiking cook set up, so I continued to refine it. 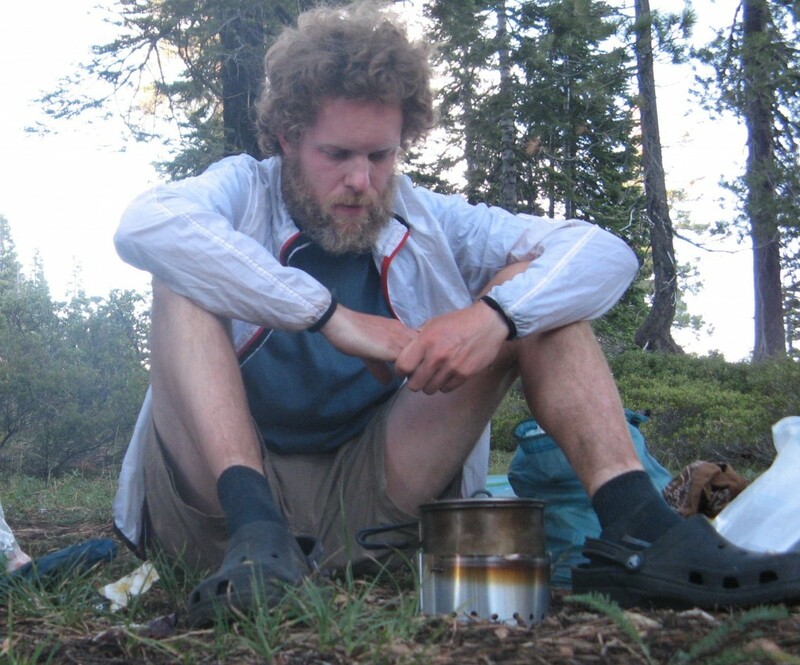 After the Appalachian Trail I made my first soda can stove for my thru-hike of the Long Trail. I had my doubts at first but finally stuck with it. I also down sized my pot to a .9 liter Evernew Titanium. For just one person I didn’t need the 1.2 liter. My early soda can stove set up was my pot, spoon, stove, knife, and a piece of tin foil for a windscreen. I would set my stove on the ground then rest my pot directly on top. This was precarious at best. Spillage was always a concern. If the ground wasn’t perfectly flat or I tried to stir my food without holding the pot it would easily fall over. Since I’m carrying limited food and that fact no one ever wants to spill their dinner on the ground, the system wasn’t perfect yet. 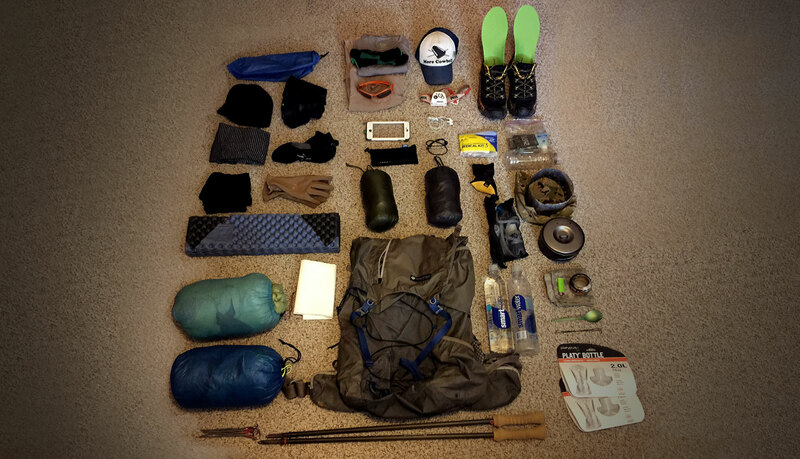 I started the PCT with this tippy, yet simple set up. It didn’t take long for holes to form in the tin foil form folding it up every night. Then one night another hiker showed me their cook set up and completely addressed the stability issue while also blocking wind. I called my dad at the next town and he shipped me what became my current set up you see on this page. The whole process was to simplify and lighten my pack weight. My other goals were simplicity, wind protection, stability, and minimum weight and care. At the end of the day you don’t want cooking to be hard. 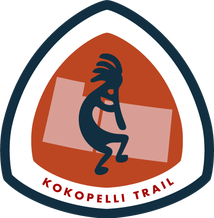 Depending on the length of the trip I either have one small container that fits inside my pot, or on longer trips I have a larger container that goes in the side pocket of my pack. There are multiple types of fuel you can use. 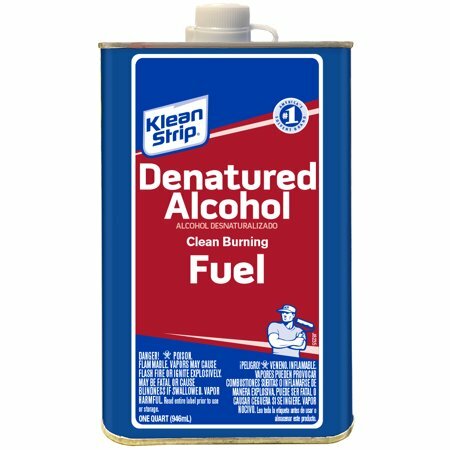 I personally use Denatured Alcohol or Heet. Depending on where you are the availability varies, but I like both of these types of fuel as they burn well and clean. With my cooking method I usually use about 2 oz. of fuel for each meal. I also only cook once a day. 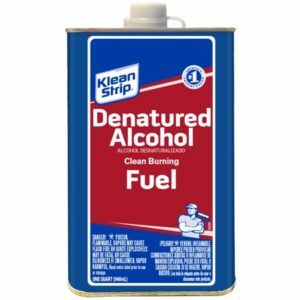 I’ll be writing a post on the Top Fuels for Alcohol Stoves soon, where I give pros/cons of which are best, where to find them and more. So check back! 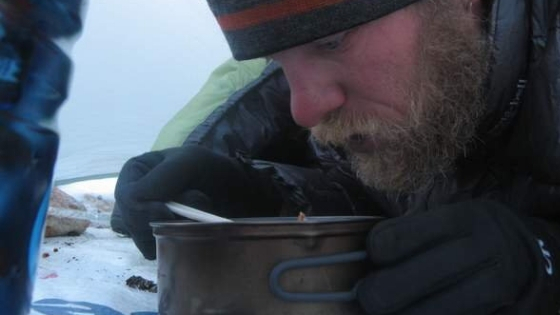 If you want more information on alcohol stoves or how to make your own stove/windscreen visit the Zen Backpacking Stoves website. Also a web search for “alcohol stoves” will bring up endless styles and configurations of stoves and how to make them. There are tons of videos online on Youtube as well. Good luck planning, building and using your own set up! From experience and talking to others I can tell you that if you made 10 stoves, you might find some work really well, and some don’t. With that said don’t be surprised if your first go around doesn’t pan out.